We have information you must know before you buy the Corvette. We're seeing attractive dealer discounts on certain configurations, which wasn't the case in previous years. Chevy is prepping an all-new Corvette for the 2020 model year. Rumors about a mid-engine design haven't been confirmed. Current offers are available on a national basis and will expire April 30, 2019 unless otherwise noted. This is big: Chevy is offering a $3,000 loyalty bonus to current Corvette owners and lessees. It's available on all 2019 Corvette models, and there's no age limit on your current Corvette. For everyone else, our advice is to compare pricing at local dealers. Those that specialize in Corvette sales are often open to discounting. Once again, the 2019 Corvette 1LT starts at $599 for 39 months with $5,789 due at signing (10,000 miles per year). The effective monthly cost is $747, which isn't our idea of a good value. Leases will probably get cheaper over the summer. As in past months, there are no APR specials from Chevy. Financing offers on the Corvette usually don't start until summer. For now, we recommend comparing rates at local dealers. The current Chevrolet Corvette has never been a bigger threat to its European rivals, with a range of potent, (relatively) affordable high-performance trims, including a new-for-2019 ZR1. While starter Corvettes have a potent 455 horsepower, the new ZR1 adds 300 ponies to that figure. 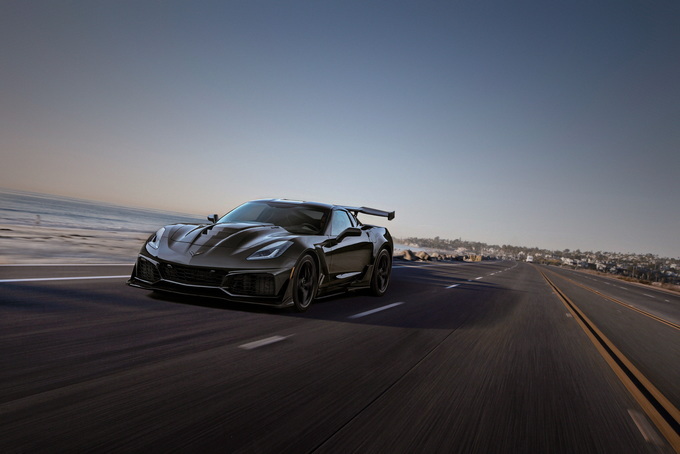 In between, there's still a 650-hp Z06, if you aren't ready for the newest model and its 210-mph top speed. 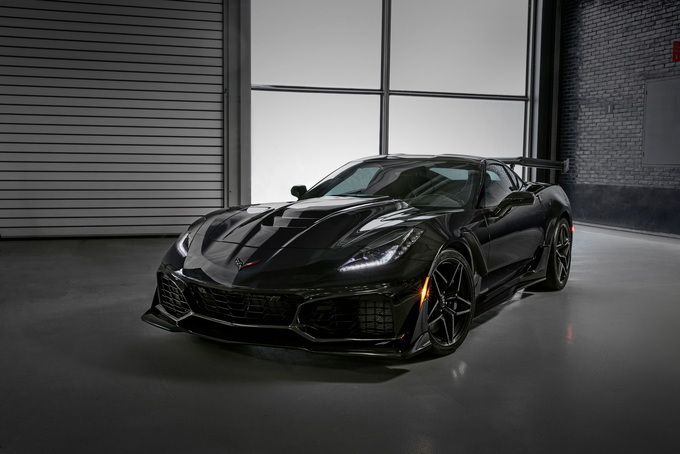 The 755-hp, 210-mph Corvette ZR1 is new for 2019, offering both coupe and convertible shoppers the craziest Corvette experience in the model's long history. All 2019 Corvettes follow the traditional form of a powerful 6.2-liter V8 engine up front driving the rear wheels, through either the standard seven-speed manual transmission with active rev matching or a $1,725 eight-speed automatic. Similarly, all Corvettes come as a two-door coupe with a single-piece, removable, body-color roof panel or in full convertible form for $4,000 more. The hardtop isn't a bad way to go – the lift-out panel is made from carbon fiber, is easily managed by one adult, and is stowable in the trunk. Coupe buyers can stick with a body color panel, or depending on the model, grab carbon-fiber or transparent panels. Convertible buyers have one of five fabric hues, although straying away from Chevy's recommended paint/fabric pairings means a $590 charge. All Corvettes can be had in one of ten exterior colors – seven for free, three for $595 – and with an array of stripe options. Two of the most desirable bits of kit are universally-optional as well: lightweight Competition Sport bucket seats ($1,995) and the navigation-enabled infotainment system with the improved-for-2019 Performance Data and Video Recorder ($1,795). While the former is a must if you're heading to the track, the latter is even more helpful, recording track sessions into an exportable format and overlaying vehicle telemetry like speed, engine rpm, G forces, and brake inputs. Where Corvette models differ the most is in the power they offer and how capable they are of exploiting it. The “everyday” base Stingray sports a 455-hp and 460-lb-ft V8 with EPA fuel estimates of 16 mpg city, 25 highway, and 19 combined with the stick and 15/25/18 with the automatic. An additional five horses and pound-feet can be accessed via the Stingray’s Z51 Performance Package or in the Grand Sport model. 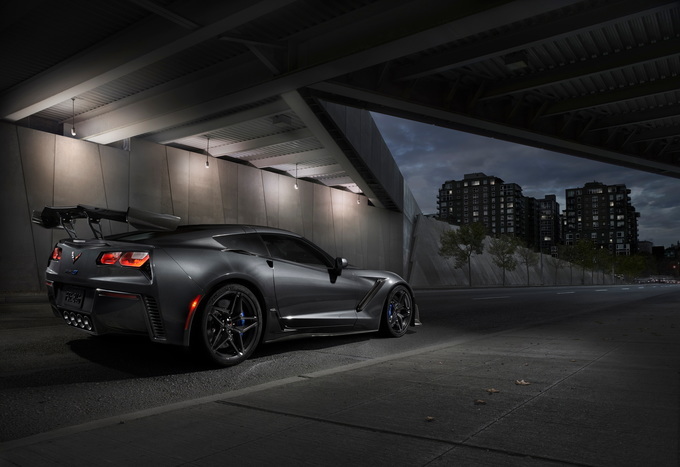 Thanks to a supercharger, the 6.2-liter V8 in the Corvette Z06 generates 650 hp and 650 lb-ft. And thanks to sportier suspension, altered aerodynamics, and more, it can make the most of it. Fuel economy takes a hit at 15/22/17 and 14/23/17 for the manual and automatic, respectively, but that’s unlikely to deter most Corvette buyers. That goes double for the range-topping, fire-breathing, super-duper supercharged ZR1. Its supercharged V8 engine produces 755 hp and 715 lb-ft. There's a “shaker”-style engine cover instead of a traditional hood to remind everyone of what's lurking in the engine bay. 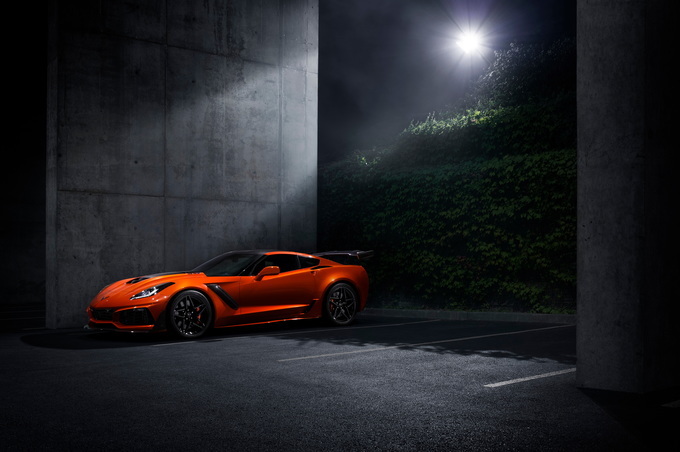 Though its power bump is prodigious, the ZR1's thirst is not. Its 13/19/15 and 12/20/15 ratings in stick- and automatic-shift forms, respectively, aren’t bad (although it is low enough to invoke the EPA’s $2,100 Gas Guzzler Tax). 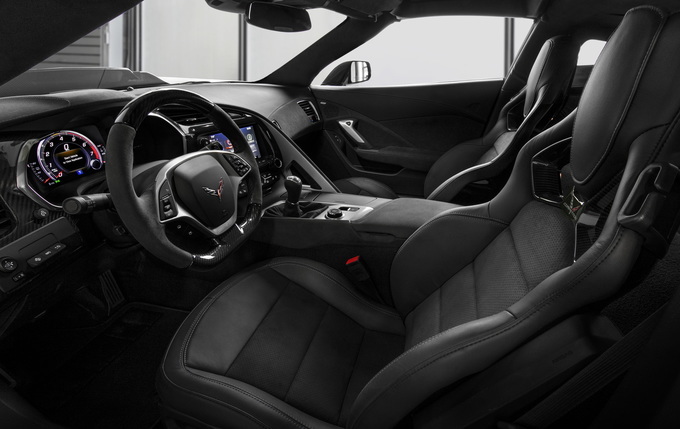 The $56,590 (including a range-wide $1,095 Destination Charge) tin-top stick-shift Stingray 1LT stands as the starting point in 2019 Corvette ownership. That's no bad thing. The Stingray comes in three equipment tiers: The base 1LT includes a surprising amount of standard gear in addition to its inherent lightweight and high-performance bits, including two eight-inch HD color displays, a backup camera, a nine-speaker Bose audio system with SiriusXM Satellite Radio, and Android Auto and Apple CarPlay capability, and GT bucket seats with perforated Mulan leather seating surfaces. Another $4,455 buys the 2LT, which ups the comfort and infotainment ante with heated and ventilated GT seats with adjustable lumbar and wing bolsters, a curb-view front camera, color head-up display, a premium Bose system and more. The top-shelf 3LT runs $5,290 and includes some of the lower tier options – like the Performance Data Recorder – along with a 3LT-exclusive custom interior with an upholstery upgrade to Napa leather plus leather or sueded microfiber trimmings throughout the cabin. All three can be outfitted with the $5,000 Z51 Performance Package and its performance suspension with specific shocks, springs and stabilizer bars, performance brakes with black-painted calipers and slotted brake rotors, electronic limited-slip differential, rear differential and transmission cooling, dry-sump oil system, performance gear ratios, aero package with rear spoiler, and power-adding dual-mode exhaust. Cars so equipped also qualify for the $1,100 Wing-Style Spoiler with Wicker Package’s black high-wing-style spoiler with wicker bill attachment, and the $1,795 Magnetic Selective Ride Control suspension with Performance Traction Management system which adds systems that automatically adjust the suspension’s firmness and lets drivers choose from five torque-reduction, brake-intervention, and steering-stiffness modes – Weather, Eco, Tour, Sport, and Track – all of which combined ensure maximum grip and performance to suit driving style and road/weather conditions. The Grand Sport line starts with the $67,685 1LT, with 2LT and 3LT tiers identical to the Stingray’s. It includes the Stingray’s two aforementioned packages – minus the wing-style spoiler and with upgraded Brembo brakes and Super Sport ZP tires – but its main feature is the standard Grand Sport Performance Package, which adds front fender inserts, wider rear fenders with low brake cooling slots, a front splitter, molded rockers, a Z06-style grille, and a wickerbill rear spoiler to the Stingray’s exterior. Surprisingly, the Grand Sport’s iconic center stripe and fender hash marks are not included, as they’re a package deal for $995. The hashes alone – both within and without – plus logoed floor mats in place of the center stripe can be had as the $795 Grand Sport Heritage Package. 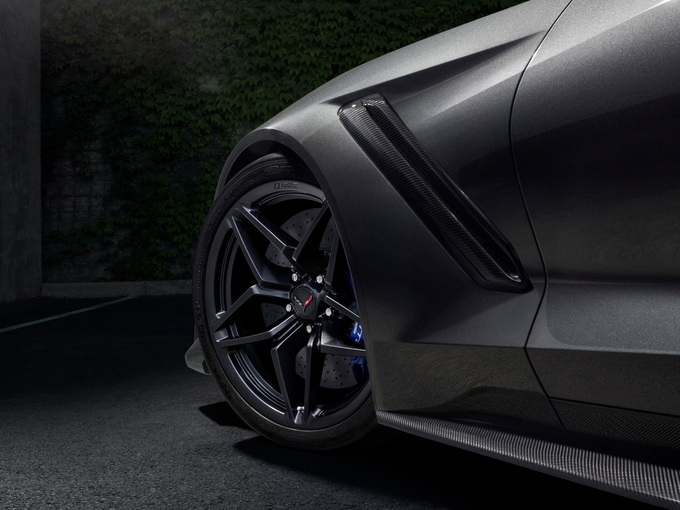 That theme carries over to the performance side of things with the $7,995 Z07 Performance Package, which further upgrades the tires to summer-only Pilot Super Sport Cup 2 run-flats, adds special Z07-tuning for the Magnetic Selective Ride Control, and, most importantly, jumps to carbon-ceramic Brembo disc brakes with Dark Gray Metallic-painted calipers – with red or orange available for $595 – that are available as a stand-alone option for $7,495. The Z06 comes in a trio of trims as well, just with a “Z” where the “T” used to be and different MSRPs. Moving up from the $81,685 1LZ to the 2LZ nets a copy-paste equipment-wise at an $890 “discount,” with the 3LZ at a $90 premium. Here, too, the Grand Sport’s $7,995 performance upgrade package is available – with an additional upgrade to a clear spoiler bridge for better rearward cop-spotting and “aggressive front splitter end caps.” Best of all, it allows owners to say they have a “Z07 Z06” at parties. That bit of linguistic entertainment, however, comes at a price. 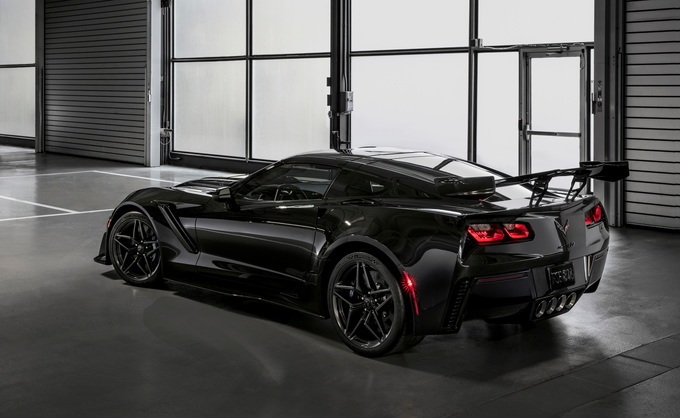 Available separately on its naturally-aspirated sisters but mandated on the Z06 is either of two Ground Effects Packages that comprise a carbon fiber front splitter, carbon fiber rockers, and a “more aggressive” rear spoiler, either in Carbon Flash-Painted ($2,995) or Visible Carbon Fiber ($3,995) finishes. Naysayers may point to the fact that from the windshield back the ZR1’s body is identical to that of its significantly cheaper Z07 Z06 sibling, but Corvettes have always been about what’s up front. Apart from a little design department fine-tuning wherever possible, nothing – not the carbon fiber-capped intercooler bulge that barely covers its supercharged monster of a motor nor the massive pedestrian-inhaling intake “mouths” that make up most of its front fascia – are there for show on the ZR1. Prices for this two-seat terror start at $125,290 for the self-shift coupe. 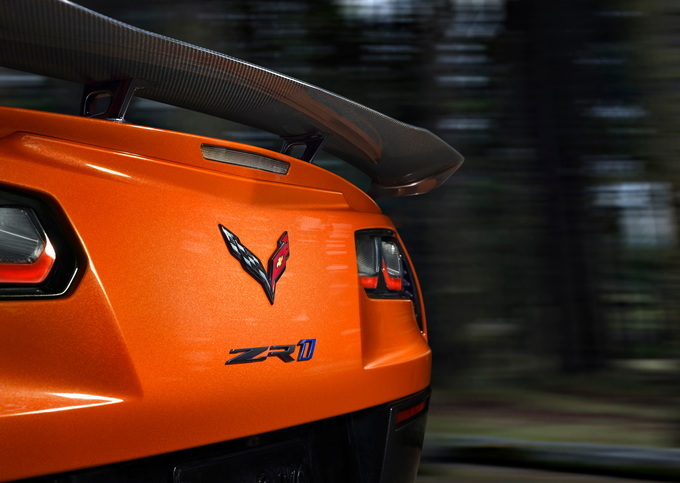 And while the flagship ZR1 may seem worthy of a unique trim nomenclature, it shows Chevy’s usual flair for cheeky name convention alterations. The base ZR1 is the 1ZR, and it’s basically equipped like every other Corvette base trim. The only major change from convention is the skipping of a middle-trim entirely in favor of an all-inclusive – and $4,000 – top-shelf 3ZR. Both tiers are eligible for the $2,995 ZTK Track Performance Package that adds a stanchion-mounted adjustable carbon fiber high wing, even more aggressively-tuned performance suspension with specific shocks and springs, and – for coupes only – removable carbon fiber end caps for front splitter intended for track use only. For those that want the pin-up-grade ZR1 found on the covers of almost every automotive publication extant, all it takes is forking over the funds to buy a 3ZR ZR1 plus another $6,995 for the ZR1 Sebring Orange Design Package. Do two things before Corvette shopping: Honestly assess what you plan to do with it, and then set a budget. If it’s an investment piece, something as ridiculously rare as a seven-speed Sebring Orange Package ZR1 Convertible is your best bet. But if you’re in it to drive it, you can get the top-shelf Stingray Z51 of your choice with every bit of kit you can imagine for about half the opening MSRP on a “standard” ZR1. And if you really want a hard-edged high-performance Corvette, a Z07 Z06 – a car Chevy itself calls the raw track-rat of the entire family – can be had at-will and for $40,000 less than a ZR1. American icon. Along with the Ford Mustang and Jeep Wrangler, the Chevrolet Corvette is one of the three universally-recognized American automotive icons. This isn't without reason: big power and a competitive price have made this sports coupe a giant-beater almost since day one. While the 2019 Chevy Corvette marks the fifth year of production for this generation, America's sports car still remains a force to be reckoned with. Performance bargain. It's simple really, no other machine brings such lofty ability to a relatively affordable price point quite as successfully as the Corvette. Sure, there are other performance-per-dollar deals like the Hellcat Dodges and even Chevy's own Camaro ZL1. But the Corvette plays in a different strata than those hot-rodded muscle cars whose roots lie in $25,000 base models. By being a bespoke, dedicated sports car that doesn't enjoy the same economies of scale as the muscle-car set, the Corvette's astonishing abilities at its given price point is all the more impressive. The numbers tell the truth of it: the entry-level Corvette gets a 455-horsepower V8 good enough for a 3.7-second zero-to-60 mph run. The chassis is competent enough to pull a full 1.00 g on the skidpad, translating to endless grip through twisty turns. A slick-shifting seven-speed manual transmission is standard. All this also costs just $56,995. Other dedicated sports cars with these kinds of performance stats will demand far more money. Porsche's equally-iconic 911 doesn't have a single variant priced under $90,000. Likewise with the Mercedes-Benz AMG GT. Even Jaguar's six-cylinder F-Type is about $15,000 pricier than the standard 'Vette. It's the same story further up the model hierarchy, with the Grand Sport, Z06, and monster ZR1 all delivering an experience far transcending their respective prices. In the case of the $124,095, 755-horsepower ZR1, supercars from the likes of Ferrari and Lamborghini will need to be concerned, as the zero-to-60 time comes in less than 2.9 seconds and top speed is 212 mph. Exotic looks. There's a reason so many starry-eyed onlookers crane their necks when the current generation Corvette goes by. With all those flares and chutes and scoops grafted onto its lewd two-door sheetmetal, the Corvette does a good job of convincing a casual passerby that they're looking at something much more exotic than a Chevy. Those who recall the Corvettes of the 1960s might not be so fond of the current look. We won't blame them – there's a lot that meets the eye with this generation 'Vette, and when it comes to timeless design that isn't necessarily a good thing. But the styling, as subjective a topic as it is, is fitting for the era we live in. It has enough of the traditional Corvette look to pacify the purists, while the details all clearly establish this version as the latest yet. Respectable interior. It seems it's always the interior where cars like these – sports cars with big performance and relatively low price tags – cut corners in the pursuit of value. This generation has thankfully tried to curb that recurring demerit, and it has largely succeeded. The cabin, once a cave of cheap plastics and shoddy quality, is now far more refined than those bad old days. Materials are soft-touch throughout, and the switchgear has a quality that matches the price point. It's a nice place to be, even if it's still not in the league of the bona fide European sports cars it competes against. Importantly, this generation marks the first time in decades you no longer buy a Corvette despite the interior. The seats are a particular improvement. They're comfortable, well bolstered, and provide good support for both interstate cruising and backroad shenanigans. Paired with the standard tilt-and-telescope steering wheel, folks of near any size or shape should be able to make themselves at home in the snug-but-not-cramped cabin. One of our favorite interior features is the available Performance Data Recorder. This little bit of tech records videos of your hot laps via a 720p camera mounted on the rearview mirror. It also collects all manner of track data, including minutiae such as steering yaw angle, percentage of throttle application and braking force, and cornering grip. If you just want to replay footage from a particularly scenic drive, there's a mode that offers video playback without any data crowding the screen. Whether you use your Corvette for relaxed cruising or plan on giving it regular track-day beatings, the PDR is a must-have option. Final thoughts. There's no question that the 2019 Chevrolet Corvette is one of the best yet in the nameplate's history. Performance is stellar, interiors are far improved, and the (relative) bargain prices remain. More than that, the Corvette's all-around excellence proves that America can still build a proper sports car ready to go toe-to-toe with the best from the Continent. It's fitting that this is the sports car which has become so representative of Old Glory, because the Corvette is performance democratized. Neither redneck nor pretentious, the Corvette throws aside class divides in its pursuit to simply be the best sports car that the Chevy guys can build. If that's not indicative of the American spirit, we don't know what is. We have partnered with trusted dealers in your area to give you a great price on the new Chevrolet Corvette.